It’s tempting to discuss the plethora of socio-cultural themes and talking points that always seem to emerge whenever George Orwell’s, 1984 is rediscovered. However, and in the spirit of sparing our Greenroom readers an exhaustive and exhausting deconstruction of the source material, I want to focus more specifically on shake & stir’s interpretation, appropriation and ultimately adaptation of the classic novel first published in 1948.
shake & stir’s production of 1984 has returned to Brisbane after a long national tour. It’s polished to brilliance and as compelling as in its first production in 2012. The ensemble of actors are stunning, the direction by Michael Futcher is equally strong in a clear and intelligible interpretation. This has been a challenge in prior adaptations of the novel where directors tend to spend unnecessary amounts of time on exposition. Mr Futcher gives his audience significantly more credit by dropping them into the reality of the piece at the start, allowing the text, characters and acting to do the job. 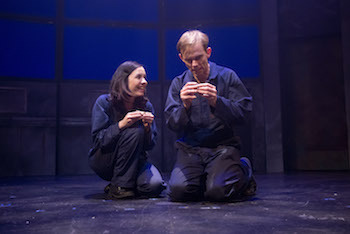 With only a couple of minor changes between book and dramatic adaptation, this production not only respects Orwell’s text but also understands thoroughly and utilises properly the politics at the heart the novel. David Whitney is evilishly good as the malicious, power-hungry O’Brien, embodying the character with unreserved confidence. Nick Skubij, in a range of characters, is especially good as the devious Charrington who disarms and contorts the lives of those around him. Nelle Lee ‘s young, promiscuous Julia – who travels furthest across the arc of the play – is always exciting to watch, and Ms Lee shapes the role beautifully. In my favourite scene Winston Smith, played by the flawless Bryan Probets, engages in a discussion with co-worker Parsons, one of the many characters played by Ross Balbuziente. They discuss the reduction of the human language and its relationship to the reduction of thought. It made me want to dig deeper into the dictionary. The production is enhanced by the contribution of design heavyweights Jason Glenright, (lighting) Guy Webster (sound) and Josh McIntosh (set and costume). Mr Glenright’s lighting is stark and harsh giving a sense of what it must feel like to be imprisoned under the glare of interrogation. Media producers Optikal Bloc create multiple images of Big Brother which loom over the action. It’s difficult at times not to feel as probed and anxious as the characters. 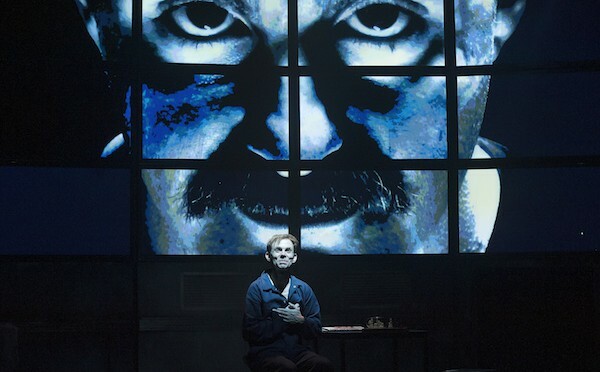 If you’re a fan of the original text, Orwell, Huxley, Bradbury, dystopian fiction, free speech, language or theatre in general, then shake & stir’s exciting production of 1984 is a must-see. You may be lucky to get a ticket, however. Word on the street is that it’s pretty much sold-out. Previous Previous post: A Singer’s Warmup? There’s an app for that.